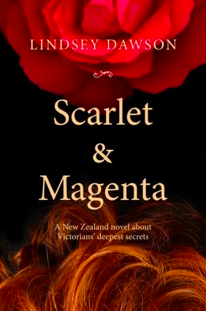 According to author Lindsey Dawson, Scarlet and Magenta is only loosely based on the kernel of truth but there is something very attractive about stories inspired by this land and the women and men who came to be here. This is historical fiction, New Zealand historical fiction but also Victorian historical fiction – and yes, if you have a penchant for bonnets and bustles, women who refused to keep their passion in check and determination not to let a man’s rule be the rod, then this is a story that will keep you turning the pages. The beginning takes a while to build up the drama but the descriptive passages set the scene for a Tauranga that is quite different from the Bay of Plenty town we know today. We find ourselves in the year 1886 and in the company of a woman named Violet who has come to the farthest point she can in the company of her husband. Far from happy Violet is a woman with a past and has secrets, a condition that at the time just wasn’t considered appropriate for a lady. Over time she finds a friend in whom she can confide but the attentions of the local Casanova add to an unfolding drama and a chain reaction proceeds that leaves little hope for a woman who is unwilling to back down for what she believes is her right – even if husband, government and country are against her. It’s a drama that gathers momentum and is appealing for its incisive illustration of human character. The watercolours of Tauranga are brought to light under Dawson’s craftsmanship and the narrative has everything that you would imagine in a town that has just started to eke a name for itself. The descriptions of Auckland and in particular the various references to landmarks and buildings is quite fascinating (and the author’s notes are well worth reading) but so is the historical backdrop that has been chosen. It is 1886 the year of the great Mount Tarawera eruption and the changes that were wrought with the largest historic eruption in New Zealand also brought with it seismic changes for our heroine and her free-thinking ways. It’s a story that manages to offer the perfect blend of romance, history and drama – all set against a backdrop that is recognisable and immediately, our own.